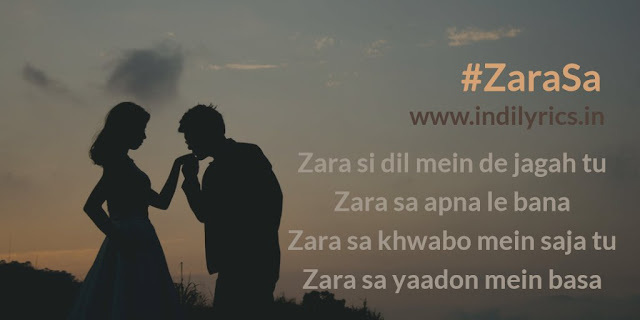 Zara Si Dil Mein De Jagah Tu Full song Lyrics with English Translation and Real Meaning from Bollywood movie Jannat – in search of Heaven, this wonderful love track is composed by Pritam while Sayeed Quadri penned the lyrics, Bollywood playback singer KK has sung this song, the music is available under the lavel of Sony Music India VEVO. The audio mp3 version of Zara Sa by KK is free to download and stream from Gaana, Wynk, JioSaavn and all the major Indian song portals, it’s 10 year old song but it’ll remain in heart of countless listeners till the last breath. The movie starred Emran Hashmi & Sonal Chauhan. Zara si dil mein de jagah tu..
Zara sa khwabo mein saja tu..